Looking for a new spot to bring your Muslim amigos for dinner? 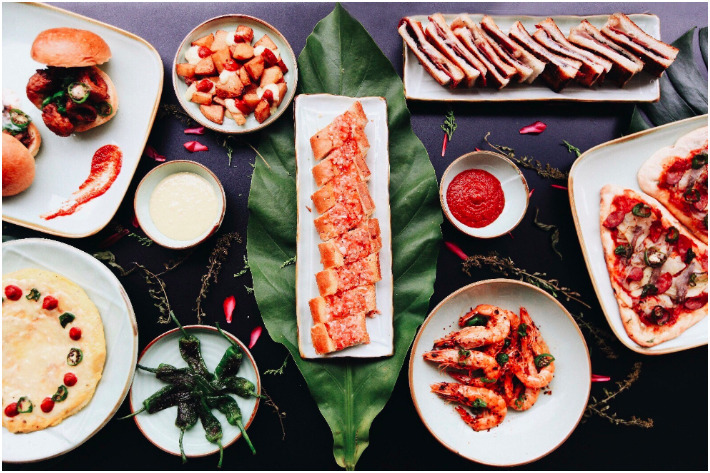 The Great Mischief is a new Halal Catalan-inspired Tapas concept in Little India that you need to know about it! Look no further for this new concept by The Black Hole Group offers a menu of savoury Spanish cuisine and house blend coffee. An overdue catch up with your compañero is calling! From the folks that brought you Working Title, Afterwit, The Mad Sailors and Santap, The Great Mischief is a new halal-certified Spanish tapas bar and the fifth installation from The Black Hole Group. Sprawled across the lobby of The Great Madras hotel, The Great Mischief adds a vibrant and playful Catalonian twist to the vintage setting of the hotel and rich heritage of Little India. Besides a humble range of delectable and affordable Catalan-inspired savoury tapas such as Coca Pizza, Croquetas and Calamares Sliders, the restaurant also offers a selection of Spanish-style desserts such as Churros and Torrijas alongside mocktails, speciality coffee and tea. Inspired by the gastronomical culture of Catalonia, this place makes the perfect spot for sharing good food and spending quality time with family and friends. If Spanish cuisine isn’t up your alley, you can check out these other Instagram-worthy Halal-certified cafés in Singapore for that caffeine fix or some late night sweet treats. Mileslife is our favourite app to accumulate miles through everyday spending. You can earn 3 miles for every dollar spent at this restaurant. Download and try Mileslife out now! You can use our code ‘Ladyironchef‘ upon your first spending to get 1,000 miles.